For the NFL player, see Austin Willis (American football). Alexander Austin Willis, CM (30 September 1917 – 4 April 2004) was a Canadian actor and television host. Austin was born in Halifax, Nova Scotia to parents Alexander Samuel and Emma Graham (Pushie) Willis. 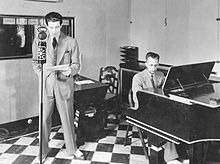 His older brother, J. Frank Willis, was a radio broadcaster with the Canadian Radio Broadcasting Commission (later the Canadian Broadcasting Corporation). In 2002, Austin was made a Member of the Order of Canada. He is best known internationally for his appearance as Simmons, the man whom Auric Goldfinger beats at cards in the opening scenes of the James Bond film, Goldfinger. Originally he was to have played Felix Leiter but, at the last minute, fellow Canadian Cec Linder switched roles with him. In Canada, he had a varied film and TV career, ranging from the early science-fiction series Space Command, to hosting Cross-Canada Hit Parade for several years in the 1950s. In the 1970s he found new fans as the host of the humorous game show This Is the Law. The Silent Force (1970) – episode "The Octopus"
^ "'This Is the Law' host Austin Willis dead at 86". ^ "Willis, Austin, 1917-2004". memoryns.ca. Retrieved 29 January 2019. ^ League, The Broadway. "Austin Willis – Broadway Cast & Staff - IBDB". www.ibdb.com. ^ "The Montreal Gazette - Google News Archive Search". news.google.com.